We can completely or partially rewire a property. This includes replacing all wiring, sockets, light fittings, switches and a new consumer unit. There is no general age at which a property has to be rewired. Unless you are having major building renovations completed, the only true way of ascertaining if a rewire is essential is by completing a full set of electrical tests on the installation. This is what in the trade is termed an ‘Electrical Installation Condition Report’ or ‘EICR’ for short. An EICR will tell you everything about the electrical installation within your property – what’s good and what’s bad! From here an accurate decision can be made on what, if anything needs to be completed. It can also be necessary to rewire if a property has been flooded or has had consistent damp problems and moisture has got into the electrical systems. The price of a full rewire will vary depending on the size of the property and the number of accessories required, eg. switches sockets etc. Get in touch with us now so we can arrange a visit for an initial assessment before we provide you with a no obligation quote. If you’re extending or altering your property or just want to change the lighting or sockets, we can carry out the electrical work for you to the highest standard. Feel free to give us a call early on in your planning so we can answer any questions and give you the benefit of our years of experience. We carry out electrical work for local businesses including offices and shops. We can install sockets and lighting including display lighting for shop windows. Give us a ring to discuss your requirements and we’ll come out to see you so we can provide you with a written quotation. We can give you power in any sheds, garages or exterior buildings that are part of your property. In the majority of circumstances, it is always best practice to install a separate circuit or sub main to give a dedicated supply to any out buildings that require power. Depending on the electrical demand you may have in your out buildings, wiring a cable into an existing socket in the house just isn’t up to the job. We can also wire up lighting, water features or any other electrical equipment in your garden. If you need more switches or sockets in your property we can do this for you with a minimum amount of disruption. If required, SM Electrical Solutions can provide re-plastering and re decoration if needed after any minor or major electrical work has been completed. Give us a call and we’ll come round to disuses your plans and answer any questions you have. We can carry out all the electrical work associated with installing a new cooker or shower. The plumbing and gas installation work can also be arranged by S M Electrical Solutions, using one of our many Gas Safe Registered contacts. Give us a call to discuss your requirements so we can provide you with a written quotation. We are experts in energy efficiency and can help you to save money whilst doing your bit to help reduce the amount of energy we’re using. We are currently supplying and installing a number of different types of low energy lighting, from a range of manufacturers. There are far too many options to list, so call us to discuss your requirements. If you’re having any electrical related problems, maybe your fuses blow regularly or you can’t get one of your lights working, give us a call and we’ll be able to solve them for you. We have a vast experience in electrical fault finding and can usually resolve most problems quickly. We use up to date, calibrated test equipment to quickly locate the fault, rather than using a pot luck method of turning on the supply and finding what makes the fuse blow! Give us a call now to arrange an appointment. If you live in a large property, or a property with outbuildings, is it possible that you may not hear a smoke alarm in one part of your property if you’re in another room or asleep? We can install interlinked smoke and heat alarms so that if one of them is triggered they will all go off, ensuring you’re aware of the problem as quickly as possible. These alarms also have a mains power supply, ensuring they will always be operational. We can repair or replace the control wiring and components, such as thermostats, programmers/timers and valves on central heating systems. If you are having a new central heating system installed, then we can also install the required wiring, test and issue the relevant certification. Give us a call now so we can discuss your requirements. We can replace your fuse box with a modern consumer unit. A consumer unit offers you much more user safety when compared to a fuse box containing re-wireable fuses. As required by current regulations, we will also verify that the supply tails & earthing conductor are correctly sized and that main bonding is in place to the incoming services to your property (usually gas and water) and upgrade or replace as required. There is much, much more information available on the in’s and out’s on changing a fuse box, so call for a free site visit and we can fully explain all the options. We can carry out electrical testing for landlords, letting agents, people buying or selling a property and homeowners alike. Electrical Installation Condition Reports or EICR for short, are recommended to be completed at certain timescales. For example, rented domestic dwelling has a recommendation of every 5 years or change of occupancy and a yearly visual check. Our complete and thorough testing will inform you of any potential and existing problems with the electrical installation in a property. From here we can then advise on the best solutions to remedy any problems that are identified. We will always issue you with the results/report from any EICR carried out by us, letting you decide on who you use to carry out any remedial works. As well as the work we do for private domestic customers, we often work in conjunction with other tradesmen and local companies. If you are a builder or other tradesman in need of an electrician occasionally we’ll be happy to discuss your requirements. We also have long-standing relationships with several local landlords and take care of all their electrical jobs. Feel free to give us a ring so we can answer any questions you have. We are an NAPIT Approved Contractors, which allows us as a business to notify any item of work required by law, to the Local Area Building Control. Certain electrical work carried out in a domestic dwelling is required, by law, to be notified to the Local Area Building Control. 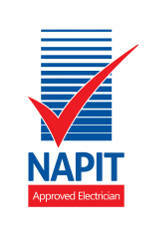 As we are an NAPIT Approved Contractor, we are able to do this for all jobs requiring notification, so in turn making the work completed at your property comply with current building regulations and thus avoiding any issues when coming to maybe sell the property in the future. Being an NAPIT Approved Contractor, also allows us to offer an insurance backed warranty for all work that falls into the category of Part P of The Building Regulations. Further details of this warranty are included when we provide quotations for work. We are based in Glossop and carry out electrician work in the surrounding area including Manchester, Stockport, Hyde and throughout High Peak.